Discussion in 'Tutorials & Examples' started by Erel, May 8, 2014. B4A v3.80 adds support for shared code modules. Shared code modules are modules (Activity, Service, Class or Static Code) that are stored in a specific folder and can be shared by multiple projects, similar to the way that libraries are shared. 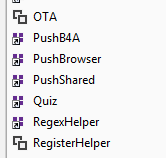 When a project is loaded the IDE looks for the modules files (bas files) in the project folder. If the module file doesn't exist then the IDE will look for the module in the configured shared modules folder. Adding a shared module to a project is done in the same way as adding a non-shared module. You choose Project -> Add Existing Module. If the module folder is the shared folder then the module will be loaded as a shared module and will not be copied to the project folder. Azam Memon, mrred128, Theera and 19 others like this. I was hoping for this already with Basic4PPC. This shows that sometimes dreams become reality . M_albrefcani, stevel05, thedesolatesoul and 1 other person like this. This is more like what I have been needing! Nice, but what is the advantage by using shared modules vs IDE modules? It is not shared modules vs. IDE modules. The IDE can load modules from two locations: the project folder and the new shared modules folder. If you like to share the same code file between different projects then you should put the module file in the shared modules folder. This is very fine thinking - so "template" ( network, server, client .. ) can make for each Projects. Is the same possible for .BALs ? Would be very useful ! I use a shared About module which has a dedicated bal file. It would be very useful to share the bal file the same way as the module file.